by Herman Hesse, 1943, 558 Pages. TLDR: 4 of 5 for a thought provoking book, though perhaps not the most riveting read. "The lesser man sees in the greater man as much as he can see." I was introduced to Herman Hesse by my Swabian friend, Thomas, who bought a copy of an English translation of his novel Narcissus and Goldmund during a visit to the medieval monastery of Maulbronn, where Hesse had studied as a youth and which was the setting for much of that novel (under the name Mariabronn). 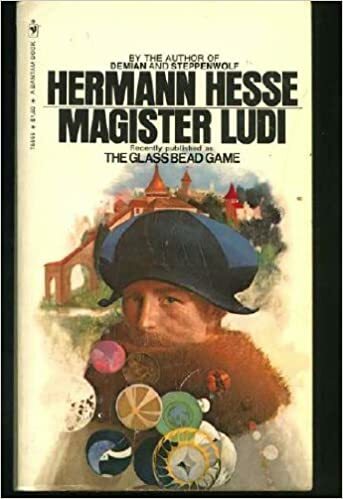 The Glass Bead Game is my second Hesse novel, and I picked this one because it can loosely be called a science-fiction novel, and because it led to Hesse's winning of the Nobel Prize for literature in 1946. The Glass Bead Game is set somewhere in the province of Castalia in Europe in the undefined future (25th C., as Hesse comments later) and is the biography of Joseph Knecht, a renowned player of the 'glass bead game' who eventually rose to become the Magister Ludi, or master of the game. The nature of the glass bead game is only ever hinted at in the novel. It is something that has descended from the highest intellectual arts: mathematics and music. The game involves the making of unexpected connections, and has a spontaneous aspect. It is also somehow related to magic theatre, which may have been an old name for it. It seems to be a purely intellectual pursuit, with little practical application, though of course its masters are considered to be geniuses. You may be drawing a connection to roleplaying games here - for other than having roots in music instead of literature, I certainly saw a great deal of similarity. This gave the book an interesting angle for me. In this biography, we learn about Knecht's education in one of the schools run by 'the order', and his eventual adoption into the order as a scholar. Knecht spends much of his time in study, but is also assigned to liaise with his Chinese counterparts (and learns about the I Ching), and with the Catholic community at the Benedictine monastery of Mariafels - a nod again to Maulbronn. Most of the rest of the biography is taken up by his interactions and discussions with fellow students and mentors, and these can wax quite philosophical. Ultimately, Knecht becomes dissatisfied with his place in 'the order' and questions whether the intellectually gifted really have the right to separate themselves from the broader world and its problems. And in this we see that Hesse's own position in Nazi-led Germany is reflected in the story of Knecht. The biography takes up only about 3/4 of the book. The rest is made up of a number of poems and three short stories, purportedly written by Knecht and published posthumously. The poetry didn't do much for me, but I enjoyed the stories - especially the second one which is set in or near Ashkelon during late antiquity. This story tells of a kind Christian monk/hermit named Josephus that people seek out so that they may make confessions and seek absolution. At one point, he hears of another such hermit, called 'the pugilist', who has a very different style and is said to beat the sins from people. Looking for meaning, Josephus decides to seek out this other monk, and when they finally meet it turns out that each was looking for the other to give meaning to their lives. Like Narcissus and Goldmund, The Glass Bead Game is ultimately about the coming of age of a young man - raised in a restricted society of intellectuals and eventually broadening his horizons. When he eventually comes head-to-head with the broader world, he finds that he must change in order to cope. The two books draw different conclusions, I feel, but share a similarity of theme. I found the Glass Bead Game to be quite thought provoking and rather enjoyed it for that reason. Is it science fiction? Not really - it's much more about reflection than about speculation. That said, I was reminded somewhat of the writing of Stanislaw Lem, and if you're a fan of his ( @BarnerCobblewood ) then I suspect you'd get something out of The Glass Bead Game as well.